Which aspects of biodiversity are of value to the poor? Does the relationship between biodiversity and poverty differ according to particular ecological conditions? How do different conservation interventions vary in their poverty impacts? 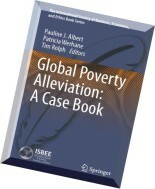 How do distributional and institutional issues affect the poverty impacts of interventions? How do broader issues such as climate change and the global economic system affect the biodiversity - poverty relationship at different scales? This volume will be of interest to policy-makers, practitioners and researchers concerned with understanding the potential - and limitations - of integrated approaches to biodiversity conservation and poverty alleviation.